The best team wins the cup. 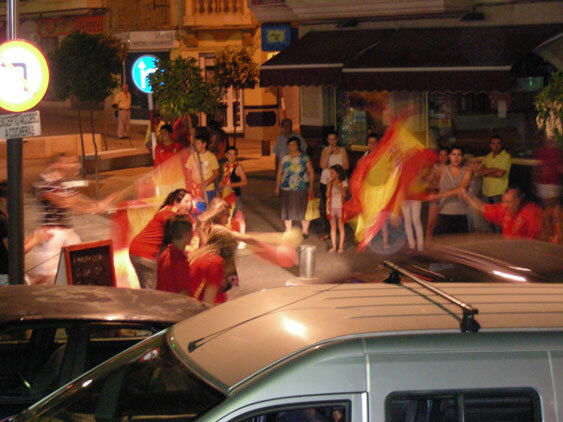 Well what a night, Jayne and I sp ent several more than just pleasant hours sat at one of our local bars in Huetor Tajar watching Spain win the world cup. I am not a fan of football normally but when you live in a place where the team are actually proud to play for their country (not just happy to take the money) and put every thing into each game it would be rude not to support them. The locals in the town certainly enjoyed a game marred just slightly by the opposition’s tactics but the end result was what counted. 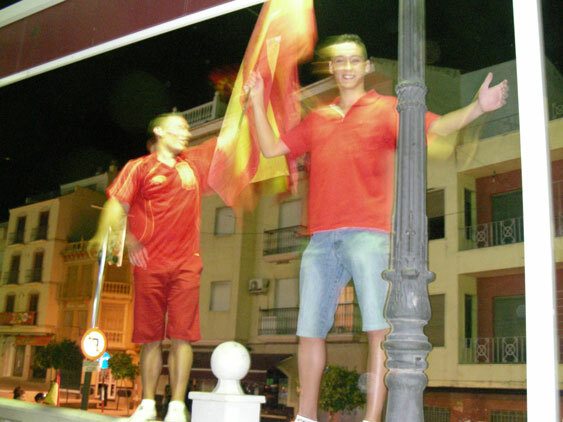 As soon as the match was over there were some incredibly noisy celebrations, both in the bar and on the streets. Masses of cars started to pass up the high street, horns blasting, occupants cheering and waving flags. Fire works could also be seen and heard, sometimes a little too close to the crowds for comfort, so we decided to make our way back home and call it a night, a very good night. Excellent wasn't it? Jan and I were at Swansea University on the final night of our Symposium - I got dragged into a quiz but Jan snuck out and watched the final and kept coming back to let us know how it was going. I'm not a footie fan either usually, but my interest got stirred when Spain beat Germany!